A scan of a deputy at the Woodbury County Jail. 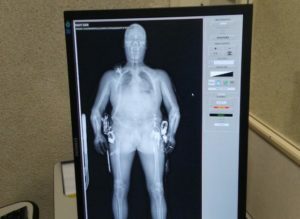 The Woodbury County Sheriff’s Office has become the second in the state to use a full body scanner to check inmates into their jail. Sergeant Lee Blanchard says the SecurePass systems is faster and more efficient. “It allows us to see things you wouldn’t normally see — any kind of contraband anything somebody might have hidden on their person — a huge way to do it without having to physically do a strip search,” Blanchard says. When a person is brought into the jail for booking, they undergo a quick low-level radiation x-ray. “All they have to do is stand on the pedestal there and hold still for about seven seconds. The platform moves through and does a full scan of their body,” Blanchard says. ” You can see basically anything that somebody has on them.” The scanner will detect metal and other foreign objects including narcotics. Major Tony Wingert says the scanner proved its worth in its first days of use when a person turned himself in at the jail to begin serving his time. He says they saw something on the scanner that concerned them and the person’s demeanor immediately changed and he started sweating, his temperature went up and he gave off clues that he may’ve been trying to hide something on his body. Wingert says they refused the prisoner and he is going to turn himself in at a later date. Sheriff Dave Drew says the funding of the 190-thousand dollar unit came from inmate room and board charges. Pottawattamie County was the first to purchase this type of scanner after a prisoner being transferred hid a lock pick in his hair to free himself from handcuffs and then shot two deputies, killing one of them.